Chad outlines a JCPenney e-mail strategy he likes, one where the brand calls out stores and landing pages and e-mail and text messaging. This works when we have two or three channels to mention. Back in the 1990s, catalog contact strategy management (horizontal marketing) was all the rage --- planning which of eighteen catalogs any individual customer should receive. Almost nobody could figure that one out, so we just mailed everybody everything! Now what the heck do we do when we have to communicate a message to customers using two dozen micro channels? Do we communicate the same message via Catalog Marketing, E-Mail Marketing, MySpace, Facebook, Twitter, Plurk, YouTube, Flickr, Outbound Telemarketing, Direct Mail, Blogs, Television, Radio, Newspapers, Newsletters, Billboards, Buses, Paid Search, Affiliates, Shopping Comparison Sites, Press Releases, SMS, Video Marketing, Hologram Marketing? There are no best practices, and there probably won't ever be, because the minute best practices are established, Facebook and Twitter will become unpopular and Newspapers will be dead, replaced by something new and shiny called "Guppie", changing the rules of the game. So the question to you, the loyal reader, is this ... how do you propose dealing with Multichannel Madness? Do you bomb your "multichannel customers" with the exact same message across micro-channels? Do you bomb your multichannel customers with different messages across micro-channels? Do you bomb your multichannel customers with personalized messages across micro-channels? Do you use some channels and not others? Do you increase frequency in some channels, decrease in others, and let the customer pick/choose from social media? Do you market to the same folks, or do you try to find new ones? If you just lost your job, this might be a place to focus your efforts ... folks will pay $$$ to anybody who knows how to manage this micro-channel marketing mess. Here's an interesting article on Whole Foods and social media. "One thing many people don't understand is that Whole Foods is incredibly decentralized --- each store sets its own policies, decides its own product selection, even uses its own recipes in the deli". Here's what we need to think about. Silo-busters and multichannel pundits tell us that we have to integrate our websites with our stores, and that we have to integrate our advertising with our websites and stores. You tell us that we have to offer the same merchandise in all stores/channels at the same price, or we will lose customers and create a terrible customer experience for the few customers who continue shopping with us. You demand that we centralize our merchandising strategy. And then we have Whole Foods, who does the exact opposite of what our industry leaders tell us to do. Whole Foods is, by most accounts, wildly successful. In fact, Whole Foods is not alone. Many retailers customize stores for the markets they serve, offering unique products and services in Dallas, while offering different ones in Portland (Nordstrom did this, for example). Each store is a micro-channel, representing a unique opportunity to be different, to serve a niche. Our websites and marketing strategy can still support each store without having to adhere to multichannel best practices. Our industry follows a script. "Buy online, pickup in stores". "Free shipping is the key to holiday success". "Mobile marketing is the next big thing". "E-Mail marketing has the best ROI". "Dell has great social media evangelists". "Multichannel customers are the best customers". "The newspaper industry is dying". "It you're not on Twitter, you're a dinosaur". "Matchbacks indicate that you must keep mailing catalogs". "Lands' End cut back on mailing catalogs in 1999, and look what happened to them", "Eight Easy Steps To Turbocharge Your Brand Via SEO", you get the picture. It is a script that is repeated over and over and over, until you believe it. You don't get invited to speak at conferences if you don't follow the script. The blogosphere is less likely to link to you if you don't follow the script. Subscriber counts are cut in half if you don't follow the script (and that is just fine with me). Analytical minds in our industry are being squelched by the script. Our KPIs are designed to reward the script. Following the script got us in the same -20% sales mess that everybody else is in. E-Mail marketing is being completely mis-measured, in large part because of our desire to follow the script. In some cases, e-mail ROI is 10x of what our KPIs report. In other cases, e-mail ROI is zero. Neither case can be detected by open rates, click-through rates, and conversion rates. Paid search is being penalized, from an ROI perspective. When catalog marketing or e-mail marketing cause a customer to click on a paid search ad, the catalog marketing or e-mail marketing activity should be allocated the expense, not paid search. We do the opposite, we penalize paid search for something that traditional advertising caused to happen. More on this tomorrow. A small number of really kind folks do you selfless favors during the course of the year. Without their efforts, you struggle. Thank you to those folks who've been kind during the year. Almost none of us know our Net Google Score. And here's a hint: Larger brands are being killed by a negative Net Google Score, while small brands strongly benefit from the advertising that large brands do, advertising that drives customers to Google, where Google re-directs customers to smaller brands. Smaller brands who depend upon Google are going to suffer in 2009 when larger brands cut back on advertising. Books. I have very mixed feelings about writing books. I'm obviously proud of the three books I've written, and they've been indispensable in the process of starting a consulting practice. Based on what you have told me, you've especially used the Multichannel Forensics text to understand how customers interact with channels. But wow, a ton of effort, and it isn't like you're going to sell 100,000 of the things. Worse, you don't have any metrics to tell you that the books are "working". And the ideas in a book need to be timeless, because the ideas can become slightly outdated in the time it takes a book to be published. Books struggle in a world dominated by Twitter-storms. Blogs. Now this is a totally different thing. The effort that goes into this blog is about 2x the effort that goes into writing a book, with a ton of metrics and feedback that help you improve in real time. This medium isn't for everybody. It is perfect for evangelizing concepts that will never see the light of day (i.e. are not part of the industry script). I doubt there's ever been a better time to introduce new ideas to the world. I'm guessing that we've passed the peak on this blogging thing --- it has become very hard to gain mindshare, and the social media elite have moved away from blogging. Twitter. After ten days of participating in the micro-blogging world, the best part is getting to see the bios of the individuals who decide to follow you ... something that is badly missing from blogs or writing books. You are an amazing and diverse audience of CEOs, Entrepreneurs, Online Marketers, Business Intelligence Experts, Social Media Mavens, Web Analytics Gurus, and Direct Marketers. Combined, books/blog/twitter yield a unique slurry of information. Use only one channel, and you miss out on part of the story. We must test free shipping promotions over the long-term ... one group of customers gets free shipping, one does not. Measure profit over the long-term, not based on a key-code or click-through. Short-term profit does not always equal long-term profit. 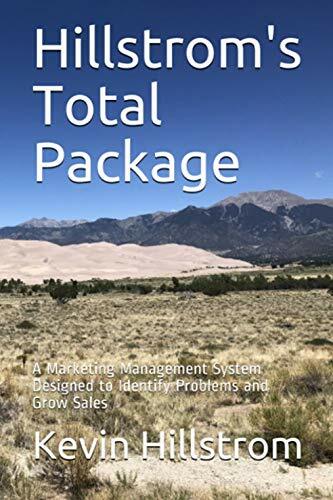 Almost none of us in the catalog and e-mail marketing industry know our organic percentage, causing us to significantly over-mail our customers and be less profitable than we could be. Hint --- you can easily measure your organic percentage via catalog and e-mail mail/holdout tests. We've messed up multichannel marketing by focusing on channels and not on customers. Urban customers skew toward retail. Suburban and exurban customers skew toward e-commerce. Rural customers skew toward catalog marketing. Using catalog marketing to drive retail sales may not be right for the urban customer, or for the 28 year old customer. Seriously --- we've messed this whole thing up by viewing it as something that everybody participates in. We're better off using these channels to speak to niches of interested customers. Mobile marketing is all messed up, you can't even get a cell phone to work across half the geography in the US (including my home), but we're all supposed to jump on this channel to offer coupons to the customer looking to buy something at Macys? The CEO of Sprint should try to update his Facebook account via their spiffy 3G phone thirty miles south of Moses Lake sometime. It's easy to do everything you want on a 3G phone in Times Square, it is harder to make magic happen on a 3G phone in Western Minnesota. Social Media is a ponzi scheme. Micro-channels matter. We'll figure out how to manage a thousand or a hundred-thousand micro-channels. Well, we'll have no choice, because we're experiencing the death of the mass audience. Best Practices squelch innovation. Best Practices are really important when running a call center or distribution center, when merchandising a catalog, or when trying to figure out how to get an e-mail into an inbox. Best Practices mean almost nothing in emerging media, in the merchandising strategy of an e-mail campaign, in multichannel marketing, or in any facet of marketing requiring innovation to drive sales. As mentioned earlier, traditional advertising fuels the online, social media, and e-commerce ecosystem. Multichannel Forensics clearly illustrate these trends. E-commerce is wonderful, but it comprises well under ten percent of total sales. Until online marketers figure out how to create demand without the power of retail brands or traditional advertising, e-commerce will continue to be a minor channel that grows by cannibalizing sales from physical retail and traditional advertising. I continue to be optimistic about 2009. We don't know where the innovation will come from, but there will be innovation, and it won't be pricing innovation or marketing innovation. I think it will be merchandising innovation --- new ways to merchandise e-mails, new ways to use social media to drive sales instead of followers, new ways to use video to create demand, new ways to use advertising to pay for the cost of a catalog mailing, new products and services that differentiate us from our competition, new online marketing leaders with new ideas for landing pages, new partnerships with non-competing brands. 2009 demands innovation, and I think we'll see it. The social media punditocracy might suggest that this forum is an epic failure, because this forum does not facilitate interaction. In other words, most blogs have an active community of individuals who leave comments. If I write articles that make you money, you don't comment. These articles are very popular, but are not "interactive". If I write articles that facilitate conversation, I don't add to your bottom-line. I'd rather focus on your bottom-line. Here are the top eight articles that received the most comments during 2008. An Open Letter To The Web Analytics Community, 14 Comments. E-Mail Marketing Gurus: Your Thoughts On Williams Sonoma, 11 Comments. Catalog Choice, You Decide What Gets In, Except When They Market To You, 10 Comments. E-Mail Marketing, Fixed And Variable Costs, 9 Comments. Ann Curry And The Today Show Feature The Cute Kids Canceling Catalogs, 9 Comments. DMA Enhances Product To Compete With Catalog Choice, 9 Comments. Cost Per New Customer, 8 Comments. An Open Letter To The Catalog Co-Ops, 8 Comments. Here's what you enjoyed the most, during 2008. Multichannel Forensics, PPC, SEO, and Online Marketing Example. A huge surprise. Online marketers have been least likely to apply Multichannel Forensics to their data (largely because they are tied to Google Analytics), but voraciously consumed this article. My Keynote Address At The Catalog Conference. Enough said. The Direct Marketing Customer Continuum. This article led to the development of the Organic / Social / Algorithm / Advertising / Begging model that has become so popular. Multichannel Customers And Advertising. Another article that led to the popular Organic / Social / Algorithm / Advertising / Begging model. A Sample Multichannel Results Meeting. You thoroughly enjoyed satire in 2008. Multichannel Forensics: An E-Mail Example. The e-mail marketing community is unique. It appears to be a modestly populated number of highly passionate quantitative individuals fighting an uphill battle against a social media punditocracy comprised of hundreds of thousands of non-quantitative evangelists. The battle reminds me of direct vs. brand marketing arguments of the 1990s. The Seattle Sonics are Moving Their Multichannel Brand To Oklahoma City. Popular among Seattlites. A Day In The Life Of A Multichannel Marketer. More satire. Micro-Channels: How Dell Arrived At Their Twitter Strategy. Write about social media and Dell, and people are guaranteed to follow along. 53 Vital Multichannel Website/Online Marketing Tips. Ever notice that marketing trade journals and bloggers often write about "X Tips For Guaranteed Breakthrough Success"? There is a reason. You love these lists! Multichannel Forensics: How A Cataloger Becomes An Online Brand. The catalog community loves reading these articles. But do you act upon the information? Retailers Using Social Technology. You enjoy seeing what other folks are doing. It's Here! Hillstrom's Multichannel Secrets. The dumbest thing I did in 2008 --- giving away free digital preview copies of a book before selling the book. I gave away more copies than I sold. Pundits, pundits, PUNDITS! They tell you what to do, without any accountability for actual results. Here's a hint: Don't give away content you want to sell, no matter what credible people tell you. Multichannel Forensics: The Building Blocks. The article outlines the basics in a typical Multichannel Forensics project. Secret Sauce. One of my favorite professional moments. Notice that most of the articles are from the March - April 2008 timeframe. Things changed once we reached June 1. More and more of you subscribed to the blog, fewer of you interacted with the content. Since November 5, that has changed, with considerable article interaction back in vogue. You buy me a $50 gift card from "Big Box Brand". I buy you a $50 gift card from "Big Box Brand". On Christmas Day, the tree is littered with mini-plastic-ads for "Big Box Brand". On the day after Christmas, gift cards are redeemed for merchandise sold at 70% off of full price ... whereas the customer, sans gift card, would have paid 40% off of full price just two weeks ago, 25% off of full price on Black Friday, and 15% off of full price on November 1. "Big Box Brand" gets a much-needed cash infusion, but takes huge inventory risk by not selling merchandise prior to Christmas, then not knowing how much merchandise will move in the days after Christmas --- and cannot record the sale until the customer redeems the gift card. If we, as business leaders, were to invent commerce from scratch, would we draw it up this way? 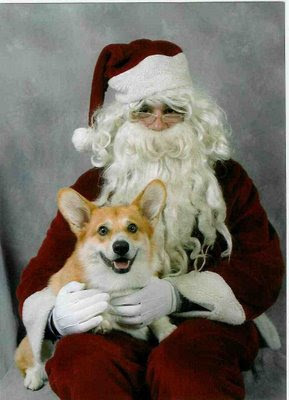 Merry Christmas, folks. Take a break from blogs & Twitter and Multichannel Forensics for a day! Sometimes we do things that cause customers to change behavior. In 2009, we might wonder why our customers don't seem to want to pay full-price for merchandise. The customer is fundamentally different now. She actually spends more, $70 per year instead of $60 per year, but she's going to shop when you tickle her buying bone. And it costs money to tickle the buying bone of a loyal customer. This style of analysis is essential in 2009. We need to see whether our thirst for clearning merchandise and "maintaining market share" in Fall 2008 have a detrimental impact on customer profitability in 2009. 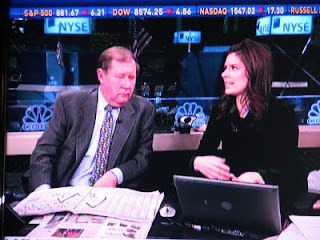 Pay attention to this image of CNBC financial hosts Mark Haines and Erin Burnett. Mark, age 62, has his newspaper in front of him, a paper loaded with information to help him get through the show. You can tell him that newspapers are dying, and it doesn't matter, this is how he consumes information. Erin, age 32, has a laptop in front of her. You''ll see her Googling topics, or checking the hurdle on a free shipping offer at Macys while speaking to the audience. As marketers, we repeatedly fail when trying to talk to these two individuals. Mark is probably not going to set up a Twitter account. His generation is the person we speak to when we mail catalogs. Erin uses search as a psuedo-administrative-assistant, in real-time. Worse, our industry hawks the standard "Multichannel Customers Are The Best Customers" line. We encourage people to read the paper and consume information online. We homogenize the overall user experience by trying to make the look and feel of each medium appear the same --- instead of capitalizing on the unique differences between channels, we try to force people into doing things the way we want for them to do things, causing both channels to fail. In this case, a picture is worth a thousand words. One of our loyal readers is trying to goad me into ripping a recent article on Multichannel Merchant. I won't link to the specific article, because 95% of the content the author writes about will increase your profits, and I don't want for this to be a criticism of the author, who is simply trying to give advice that will help you. But I do want for us to consider one of the quotes, the exact quote sent to me by a loyal reader. "Correlation analysis suggests that as much as 90% of the unallocated orders that come to the Web for the multichannel marketer are directly related to catalog mailings". We need to consider three phrases in the sentence. Correlation analysis suggests (this means we cannot prove the findings that follow). As much as (this means the real number is always lower than what we will be quoted). Directly related (this means we cannot prove causation). Based on the linkage of three phrases, an entire industry moves forward with an agenda, an agenda based on a linkage of assumptions that may or may not be correct. Do you realize the leap of faith required to believe in this sentence? We listen to quotes like this because we want to believe the sentence. Now it is entirely possible that those who adhere to the tenants of the sentence quoted above are right, and will experience unbridled success. I grant you this point. But are you willing to grant me my point ... what if one, two, or three components of the sentence are wrong? What does that mean to the success of the businesses we manage? Review the content offered by bloggers, trade journals or industry experts, and you'll find that creative integration of multichannel marketing is essential. We're told that prices should be the same, and that the merchandise offering should be consistent. E-mail, landing pages, catalog/direct-mail all should have the same theme and fonts and colors. Has this theory been tested? In other words, is there a library of results somewhere that prove this hypothesis? Or, is this simply VCB (vendor, consultant, blogger) speak. Obviously, I cannot share actual customer data with you. But I can give you a few hints about how to look at these relationships. Organic Customers: One sure way to ruin the organic customer relationship is to run free shipping promotions. The customer was going to buy anyway, and then we willingly throw away gross margin dollars. I'm not saying free shipping is bad --- it is the putting it on / pulling it off deal that is bad. Also, organic customers are willing to use algorithms --- this is why calculation of the Net Google Score is so important. 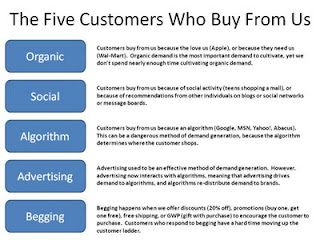 Algorithm Customers: Pay careful attention to these customers. If the customer does not use a key code on a future order, don't assume that any catalog drove the order. This is one of the places where matchback programs can be wrong, costing you profit. Social Customers: In the limited amount of data I've been able to play with here, these customers are fundamentally different than all other customers we manage. Advertising Customers: These customers may not migrate to organic or algorithm status ... and that, my friends, is a bad thing. Catalogers say this all the time --- they say they don't get business if they don't mail catalogs. For these brands, the advertising-based customer won't become an organic or algorithmic customer. Hint --- for these brands, developing algorithmic and organic customers needs to be a top priority in 2009. Begging Customers: Migration analysis is critical here. Does the incentive/promotion customer respond to advertising, or to incentives/promotions? We make so many mistakes here --- sending expensive advertising to these customers, when the customer doesn't care about the advertising --- the customer cares about the incentive attached to the advertising. Find a way to dramatically reduce advertising expense if these customers will not migrate to advertising response. This is a ten page transcript of the Best Buy investor conference call. The company announced that it is offering voluntary separation to 4,000 salaried employees, nearly every salaried individual. The company says it may not get enough volunteers, requiring involuntary separation. The company also makes the brazen statement (multiple times) that it is "employee-centric", in the midst of communicating the need to fire employees. And from page three to page ten, the investment community are given the chance to ask any question they wish. They ask about capex, about inventory management, about gift cards, Rewards Zone, Geek Squad, vendors, gross margins. They ask multiple questions about Circuit City, for goodness sake. They do not ask one single question about employees, about voluntary separation, or about involuntary separation. And you'd think they would care about how much money would be saved, wouldn't you? Our system of business harvests people, uses people, exploits people, manipulates people, over-works people, under-pays people, scams people, and demands revenue from people. The system praises those who shed "headcount", then grumbles when "headcount" has no money to spend to fuel capitalism. Our system of business does not care about people. If it did, would we be knee-deep in The Great Implosion? Catalogers ... pay close attention to "breaking news" about Detroit newspapers ceasing delivery of newspapers except for Thursday, Friday, and Sunday. You keep telling me that you won't have a business if you cannot put catalogs in the mail. Well, we're going to get to observe an actual case study soon. Pick an online analytics service (i.e. Quantcast or your personal favorite) and pay close attention to traffic trends, pre/post delivery decision, comparing these businesses with newspapers that continue home delivery. Does home delivery inspire online readership? We're going to find out. Worse than a recession, better than the Great Depression, I coin our current economic situation "The Great Implosion". I'm not sure when you first thought something was amiss. For me, it was the Spring of 2005. Nordstrom would announce spectacular annual profit levels, driven by robust comp store sales growth. Our stock price, languishing in the $8 to $13 range for years, surged past $30 in the Spring of 2005 (and would peak in the upper $50 range in early 2007). Well, good unless you were a garden variety analyst in the Database Marketing department, where we were handing out salary increases that, on average, were on par with inflation. I recall that my team howled at the injustice. They worked long hours to simply keep up with inflation, then went online and read the insider trading summaries, observing the ways we in management supplemented our compensation. My team felt that one of the one hundred greatest companies to work for might be able to offer them more than inflationary salary increases. Of course, Nordstrom wasn't acting out of the norm, and wasn't trying to be nasty to employees, not in the least bit. The sole responsibility of a publicly traded company is to increase shareholder value, not to offer a database marketing staffer a higher-than-average wage. It could have been worse for Nordstrom database marketing employees. Take AT&T, for instance. AT&T gave thousands of employees walking papers, then increased the dividend to shareholders. Gotta love capitalism! Floyd Norris of the NYTimes shows us that from Q4-2004 to Q3-2008, S&P 500 companies generated $2.4 trillion in profit. They converted the profit into $1.7 trillion in stock buyback programs and $0.9 trillion in dividends. Shareholders made $2.6 trillion from the $2.4 trillion in profit generated by S&P 500 brands. The data imply that S&P 500 brands had to borrow, in order to hand profits to shareholders while growing sales. This author of this article suggests that Nordstrom took on $1.5 billion in debt during the past few years, while buying back stock during the bubble, and is now on the hook for a hundred million dollars in interest payments each year, while absorbing huge comp store sales decreases and credit challenges. Nobody should have been surprised that employees used their homes as a giant piggy bank, especially when the hopes of getting ahead in corporate America were/are slim. Borrowing against a home increasing in value became a vehicle to perceived affluence. And when the piggy bank finally broke, the entire economic system collapsed --- The Great Implosion began. TechCrunch keeps track of layoffs ... the numbers continue to grow. Worse, employees who get to keep their job will spend the next decade paying taxes for funds that bailed out the financial sector, a group of companies that largely benefited from the profit generated by S&P 500 brands. The past eight years amounted to a gigantic redistribution of wealth. It was like a giant roulette wheel, where companies and employees made bets, periodically winning and losing, until a 00 turned up. The house collected while everybody wondered "what just happened?" Now we have no choice but to dig out of The Great Implosion. Long-term, we won't do this by offering customers up to 60% off and free shipping. And we probably won't do this by ever trusting financial institutions again ... or by trusting big brands. We'll have to dig out of this by being crafty. I get to work with companies in different geographic areas. Out West, I often work with startups, folks who exhibit very little fear --- they are hiring, finding funding, moving forward, creating products that will meet the needs of a future customer. Elsewhere, I pay close attention to brands that have been around for a long time. Fall 2008 results are not optimistic ... these folks are hit hard by a spending slowdown. They are also being hit by the redistribution machine known as Google. These companies work hard to generate demand, only to see Google take a penny here or there (on a massive scale) while re-directing demand to those who are best at playing the search and online marketing game. In the Fall of 2008, companies don't know how to fight back ... we simply race to the bottom, moving inventory at any cost. None of us can know what the long-term impact of an extended period of "up to 60% off and free shipping" will do to e-commerce. One might surmise that the impact won't be positive. Most interesting to me is what will happen online in 2009. Assuming that customers continue to cut back on spending, leading to cuts in advertising by brands, it is reasonable to assume that Google will suffer. When Google stops fueling the growth of the online ecosystem, really interesting things start to happen. The next generation of great online marketing leaders will come from this pressure-cooker. This new generation of leaders are, in my opinion, going to be different individuals than the ones that rode the updraft of e-commerce. An entirely different skillset is required to acquire and retain customers when times are really bad. The e-commerce leaders of the next decade will create merchandising strategies that get customers to spend once again. Today, e-commerce is capable of taking orders ... it is not good at creating orders (as Alan Rimm-Kaufman says). This is one of the business tragedies of The Great Implosion ... we learned how to capture, intercept, and re-direct demand (often cannibalized from other channels), but we didn't learn how to create it. I am actually filled with optimism about 2010 and beyond. I truly think this will be a period of tremendous innovation and creativity. This brings us back to the employee, the individual hosed by The Great Implosion. We have a responsibility to bring something to the table. We have a responsibility to innovate, and to be creative --- and if our employer won't recognize our innovation and creativity, we need to find another job, or start a business of our own. We need to compete! Or as Scott Adams of "Dilbert" fame recently suggested, maybe we need to have a diversity of bosses. Working for one bad one isn't great, working for numerous bosses allows us to pick and choose. Time for your thoughts about The Great Implosion. What do you think will happen over the next few years? There are nice catalog marketing zip codes in Alaska as well. Buy online / pickup in stores doesn't work so well in Alaska. 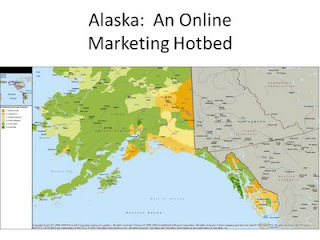 This is one state that would benefit from a bit of customer understanding and personalization! Hillstrom's Zip Code Forensics is free for all direct marketers contributing anonymous, annual sales totals by physical channel (mail, phone, online, retail) at a zip code level. To-date, participants are seeing an improvement in direct marketing activities against the six segments of between 5% and 20%, based on actual tests and backtests. I'm also looking for a few more B2B volunteers --- I am creating a separate model for businesses selling to businesses --- the dynamics are simply different than the B2C model that has been created. Please contact me if you want to participate, for free. You've been through this drill before, haven't you? Your CMO or CEO or CFO wants to know "what would happen if we cut twenty percent from the marketing budget?". This is where you use the square root rule to your advantage, allowing you to give a "back of the envelope" answer to questions that require a lot of time and energy. Assume you spent $1,000,000 on marketing last year, generating $3,000,000 sales. Your profit factor is 35%, yielding profit of $3,000,000 * 0.35 - $1,000,000 = $50,000 . Step 1: Sales = (($800,000 / $1,000,000) ^ 0.5) * $3,000,000 = (0.894 * $3,000,000) = $2,683,282. The "0.5" number is the square root ... you are taking the square root of the ratio in change of marketing spend. In this case, a 20% reduction in spend yields a 10.5% reduction in sales. Step 2: Profit = $2,683,282 * 0.35 - $800,000 = $139,149. In other words, you'd lose a little over $300,000 in sales, but profit would increase by nearly $90,000. The square root rule allows you to play these "what if" scenarios ... and the scenarios are important. Sr. Management needs to get directional answers quickly. You don't want to do a ton of work, only to have the CFO tell you to run a new scenario where you cut marketing expense by 33%. Is the square root rule 100% accurate? Absolutely not. In fact, there are times when it is blatantly inaccurate (affiliate marketing, shopping comparison sites, e-mail marketing). When your leadership team needs an immediate answer, at an aggregate level, this rule of thumb works well. Modern cataloging disproportionately skews to various rural areas in New England. This map illustrates a hyper-responsive cluster of zip codes in New York, Vermont, and New Hampshire. Urban areas (Boston) love e-commerce. Rural areas shop via catalogs, and shop disproportionately over the telephone. Our job is to recognize the fundamental differences in customer behavior represented by geography. Mobile marketing and social media and a "Twitter-storm" are not as relevant in New Hampshire as a well-merchandised 124 page catalog that drives the customer to a call center, where a pleasant voiced sales associate walks a customer through an order. The fact that almost nobody in our industry talks about this stuff is a bit surprising, isn't it? After all, you can improve the profitability of marginal segments by between 5% and 20% by applying Zip Code Forensics, based on actual tests and backtests. "... our bailout of Detroit will be remembered as the equivalent of pouring billions of dollars of taxpayer money into the mail-order-catalogue business on the eve of the birth of eBay". Thomas L. Friedman. NY Times Op-Ed Piece "While Detroit Slept", December 9, 2008. Our government will toss Detroit billions. Yet our government hammered us in 2007 by dramatically increasing postage (the opposite of a bailout). It's funny ... nobody cares when the Circulation Manager at Red Envelope loses a job ... no bailout for this poor sap. And our industry stands up to our responsibility ... heck, many of us partner with a business that is just plain mean and condescending to us publicly. We're taking catalogs out of the mail at a rapid rate (take that USPS), moving our businesses online. We're evolving. We don't need no stinkin' bailout!